Ohio Gov. 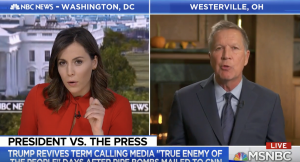 John Kasich's (R.) call for both sides of the aisle to dial down their heated rhetoric was met with repeated interruptions on Monday from MSNBC anchor Hallie Jackson when he started criticizing Democrats. Kasich appeared on Jackson's program in the aftermath of Saturday's mass shooting at a synagogue in Pittsburgh that left 11 dead and the spate of explosive packages sent last week to prominent Democrats and White House critics by a far-right supporter of President Donald Trump. Jackson played a clip of former Homeland Security Secretary Jeh Johnson, who was appointed by President Barack Obama, saying Trump "has the largest bullhorn" and the duty of setting a proper tone. Kasich, a frequent critic of Trump, agreed but also said Democrats like Hillary Clinton and Eric Holder bore blame for the breakdowns in civility. "I was very, very strong about my feeling about how the president has conducted himself. It's part of the reason why I didn't endorse him," Kasich said. "But as long as we're going to go back and forth, this and that, it's like a civil war." Jackson interrupted to ask what he meant, saying it sounds to some like "whataboutism." "Hallie, Hillary Clinton said—and I like Hillary—Hillary said, ‘When they go low, we got to go lower,'" Kasich said. "We heard that out of Eric Holder. There's rhetoric and nasty stuff being said on all sides." Clinton's actual quote was that "you cannot be civil" with Republicans with the policies they were pursuing, while Holder said at a recent stop on behalf of Stacey Abrams in Georgia, "When they go low, we kick them." Jackson kept trying to speak over Kasich while he continued on and called on Trump to be more careful with his language as well. Trump has been criticized for such language as calling the media the "enemy of the people" and praising Rep. Greg Gianforte (R., Mont.) for body-slamming a reporter last year. "Let me just pause you there … I don't want to skip over that piece of it because Eric Holder did say he wasn't advocating anything illegal or inappropriate in basically that same breath," Jackson said, before quoting critics of Trump who said he also hasn't been forceful enough in denouncing anti-Semitism and white supremacy. Kasich touted being the most outspoken Republican in the party against Trump's rhetoric but again said it was the responsibility of all sides to cool things down. "It's on all of us. It doesn't matter who you are. It's on everybody to stop this, because what's happening as we reach a fevered pitch, people who are unstable, unbalanced or sick can have a tendency to do crazy things," Kasich said. "On the other side, everybody's got to calm down. It's not just one guy."